This afternoon I checked on the chickens as usual and didn’t see Executive Presence (nee Bossy) anywhere. I figured she was laying an egg, so I opened the nest box door; the worried look they give you is fairly hilarious. Not in there either, though. Uh oh. She’s hunched down in the main area of the coop and not moving. I pull the roof off and she’s definitely not well, she doesn’t put up a fight at all. Betsy and I sprung into action and rushed her to the chicken vet, but she expired right after we got her inside. 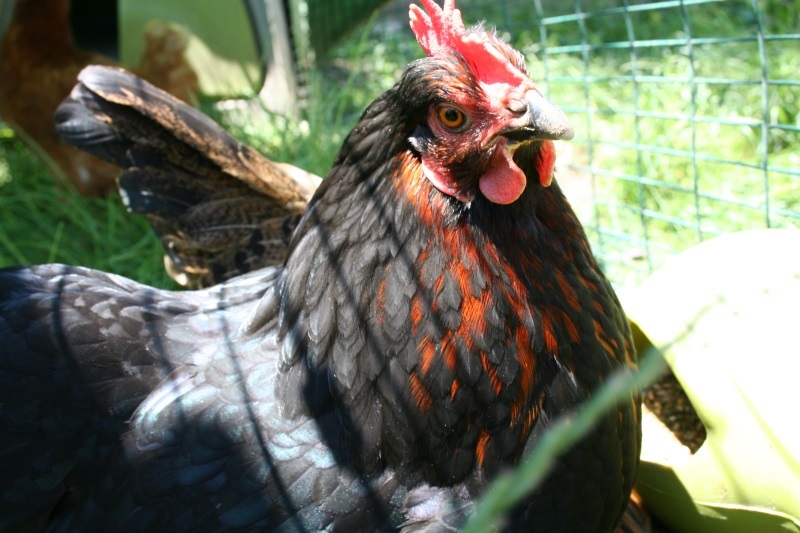 Unlike Shy Chicken, who had egg binding, the vet suspects reproductive issues that commonly strike chickens as they age; she was coming up on her 6th birthday. In happier days, making a dust bath. She had a magnificently large personality in addition to the sweet black feathers with purple highlights and red underfeathers. I’m so sorry for your loss. With those colors, she was truly a goth-chick.